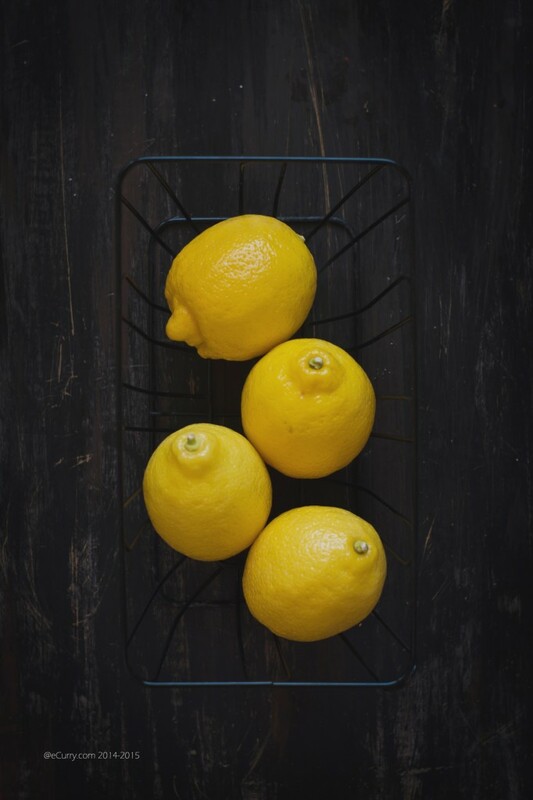 Lemon tarts are something I have always had a special kind of fondness for. 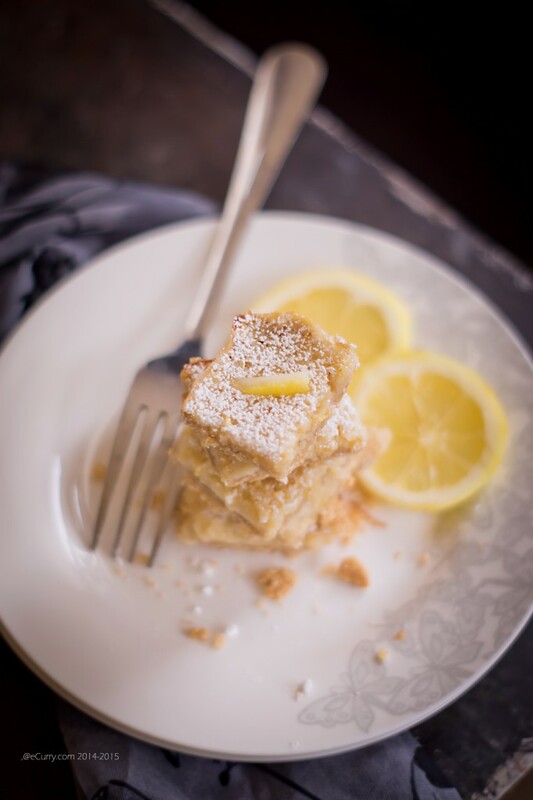 I would walk past the curved glass cases enclosing rows of creamy swirls that topped the luscious layered pastries and went straight for the lemon bars or the tarts. 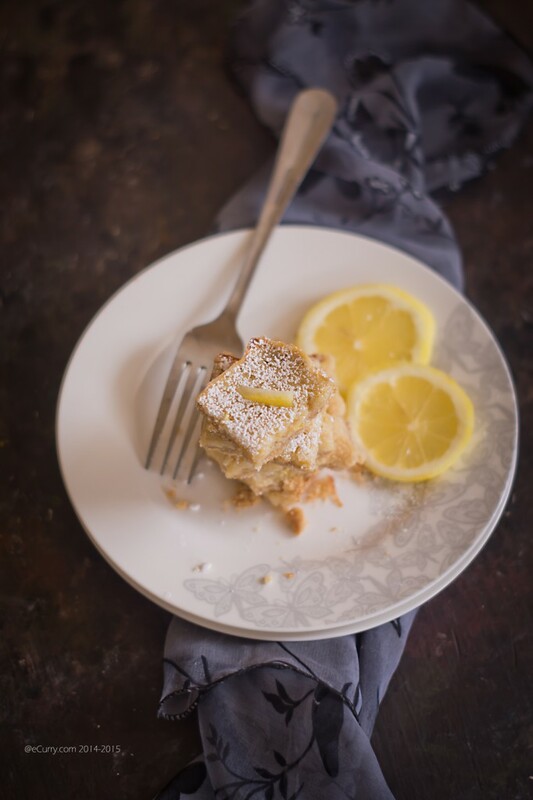 There is something about the tart, creamy smoothness of the lemon flavored dessert that still makes me go weak in the knees. Everything in Flurys always made me lose control. This timeless charm probably still stands as the best Tea Room of Kolkata. To me it always will be. It is rich with traditions and memories, and I can still smell the confections and the sweet happiness that I soaked up in my younger days… From the endless variety of cakes and cookies, not to mention the accompaniments that is so typical to the English tea, it is a tough decision to make and we have always had packed an assortment in multiple boxes to take back home. The lemon tarts were unfailingly mine. Only mine. 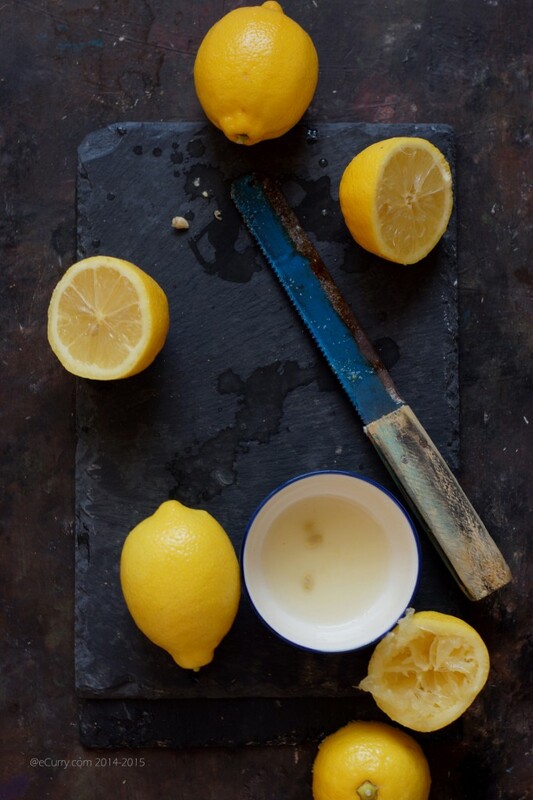 As much as I am partial to lemon tarts or curd, I have backed out every single time I have wanted to make them at home. There is no apparent reason but I have invariably found myself evading from the butter and eggs that the recipes ask for. It is the same reason I never make fruit curds at home except for that one time I was able to move past the dealing with raw eggs and made the clementine curd. But never after that. This is something I have to overcome someday! 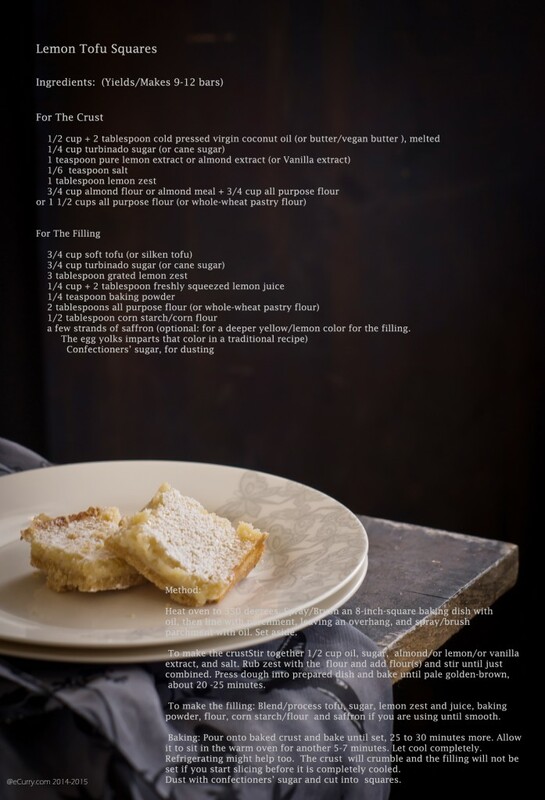 So when I came across this recipe in the Whole Living magazine, I was drawn to it. 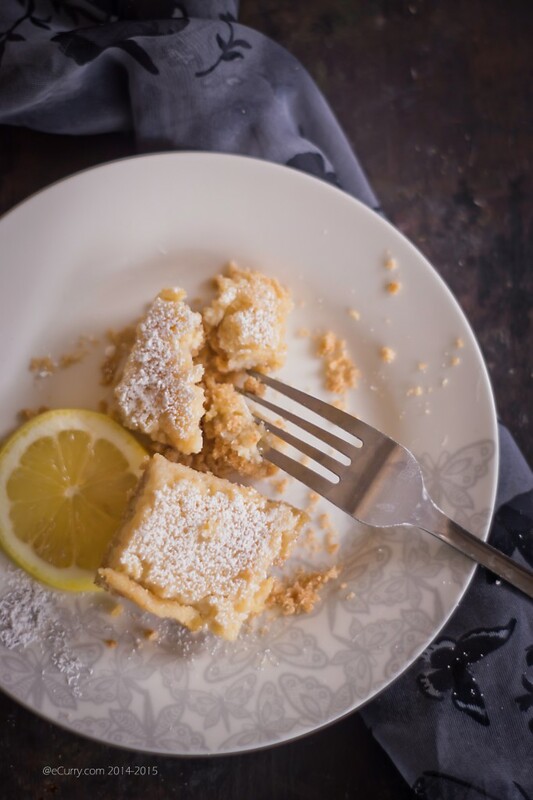 Vegan Lemon Bars. The unusual aspect of it appealed to me in a strange way. It was more than that. I started obsessing about it. I dog-eared the page and started to read through it everyday until I had memorized. On the other side of the cooking and baking, I have completed a few fictions this past two weeks. I read late into the night and I read all day. I read while doing chores and washing dishes. It was after a long time that I read this kind of obsessive reading. Chitra Bannerje Divakaruni’s Oleander Girl, One Amazing Thing, The Sister of my Heart, Khaled Hosseini’s The Mountains Echoed and Jhumpa Lahiri’s The Lowland were among the top few. It was after a few months of waiting that I finally got to pick them from the library. 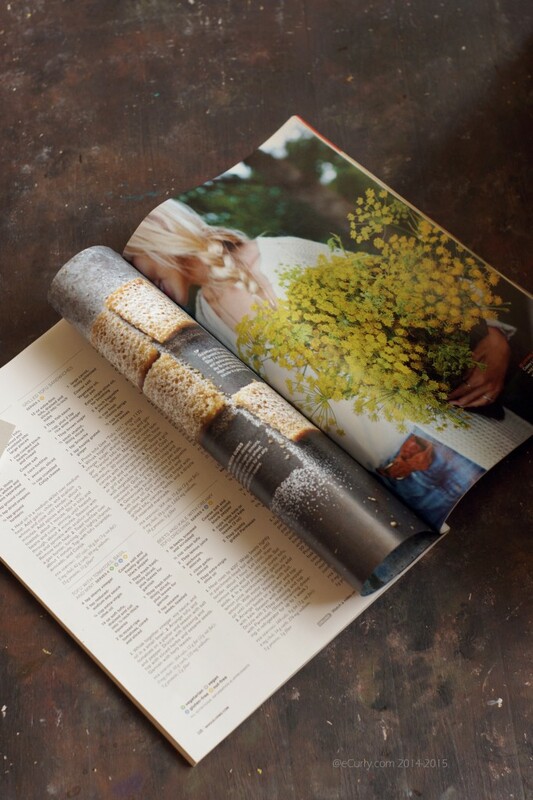 While I fold the corners of magazines to bookmark recipes or articles I would want to come back later, I never fold the pages of any other books. Do you wonder about what others could be thinking when you are reading a borrowed book? Well, the books have nothing to do with the recipe today. Except for the dog-ear…I am not sure it is the tiny fold in the corner that made me think of it. The complexity of human mind; the “monkey mind” which refuses to stay in one place and of late I have had mine hopping all over the place. I felt I found the perfect recipe, which uses no eggs or butter. 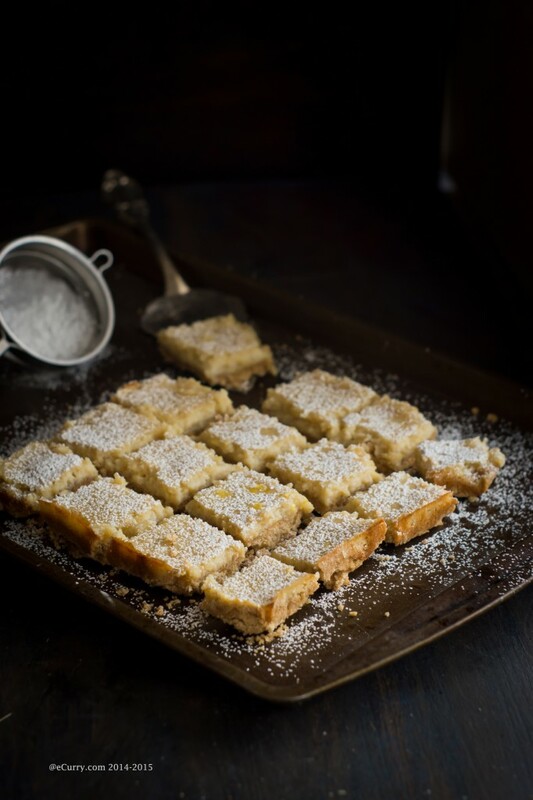 They looked fantastic, as good as any other lemon bars. It was also healthy. It had tofu. I went ahead and googled some more. Just to see how the tofu works here for I had never used tofu in a dessert. I came across a lot of people who have used this exact recipe and had rave reviews about it. So it was okay for me to give it a try, I thought. Hmmmm…Tofu. That was probably what made me wait for so long even after obsessing over the recipe. However since I was so intrigued by this recipe, I had to do it. From top left clockwise: Combine the ingredients for crust and pat them in the tray. Pour in the filling and bake until set. 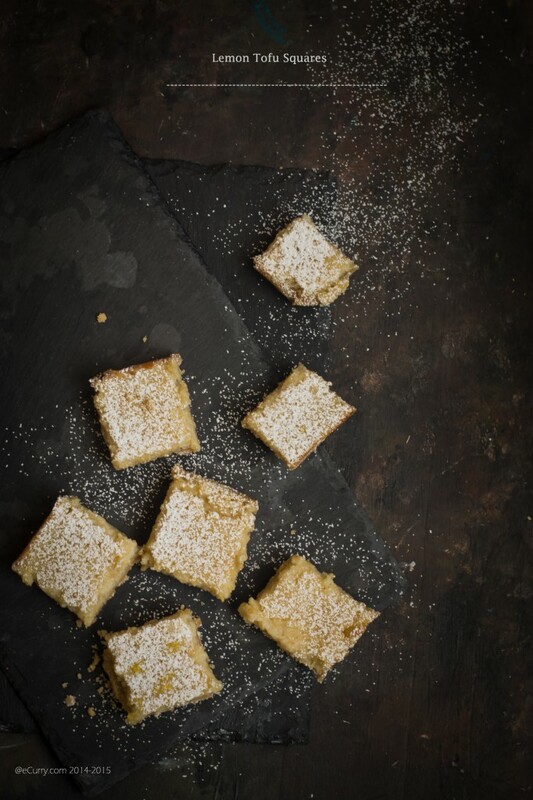 I cannot fool myself to say that these were the best lemon bars I have had. Perhaps Flurys had raised the bars. They were okay. But considering they had neither eggs or butter, I can slide the marker to good. They did not lack in creaminess or flavors. The texture was almost about right too. The filling did not have the translucent glossiness of lemon curd. It could not. It is tofu! Maybe I was expecting too much? I am not sure what exactly it was that made them different. 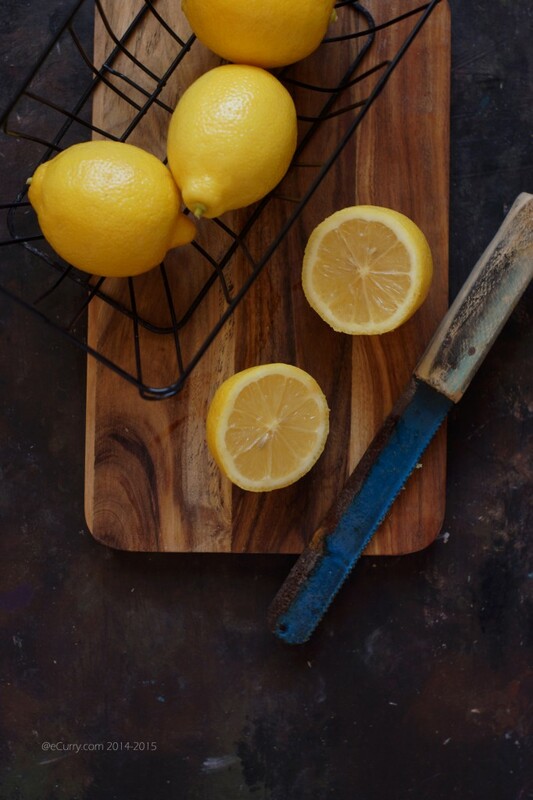 I tweaked the recipe over the few times I made it more to my liking and I will hold on to this recipe until I teach myself to make a good lemon curd without eggs. Heat oven to 350 degrees. Spray/Brush an 8-inch-square baking dish with oil, then line with parchment, leaving an overhang, and spray/brush parchment with oil. Set aside. 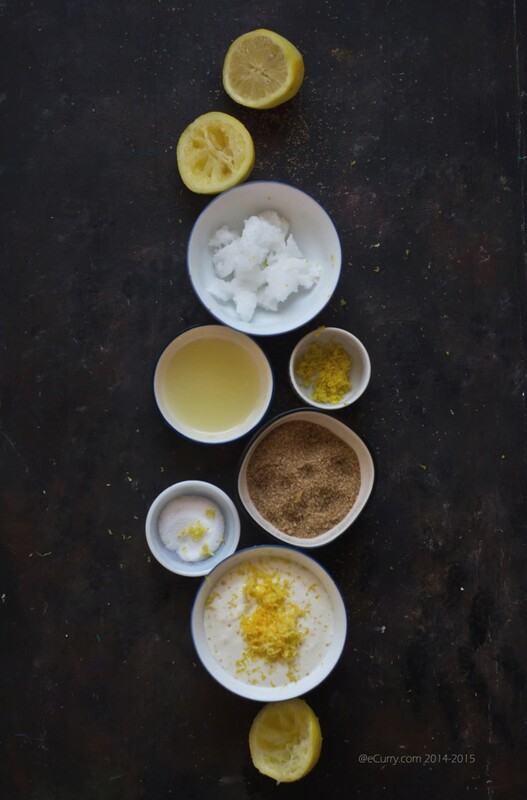 Stir together 1/2 cup oil, sugar, almond/or lemon/or vanilla extract, and salt. Rub zest with the flour and add flour(s) and stir until just combined. Press dough into prepared dish and bake until pale golden-brown, about 20 -25 minutes. To make the filling: Blend/process tofu, sugar, lemon zest and juice, baking powder, flour, corn starch/flour and saffron if you are using until smooth. Baking: Pour onto baked crust and bake until set, 25 to 30 minutes more. Allow it to sit in the warm oven for another 5-7 minutes. Let cool completely. Refrigerating might help too. The crust will crumble and the filling will not be set if you start slicing before it is completely cooled. 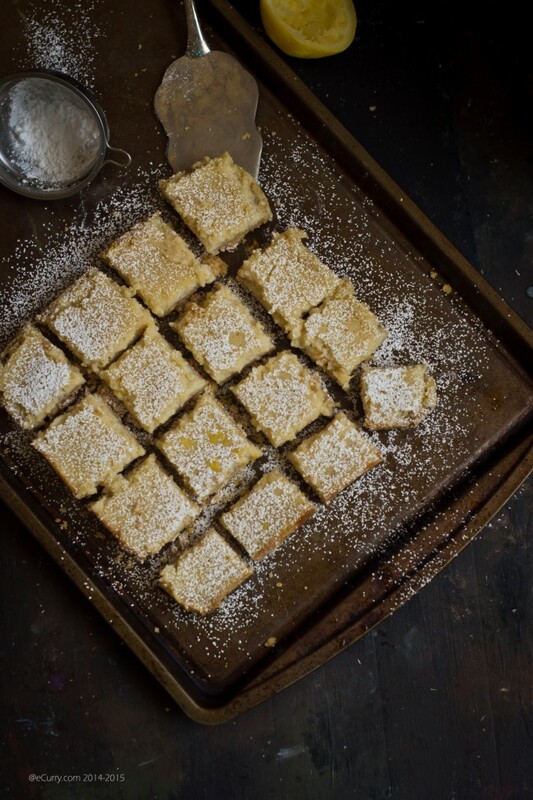 Dust with confectioners’ sugar and cut into squares. An interesting recipe and combination! They look divine. 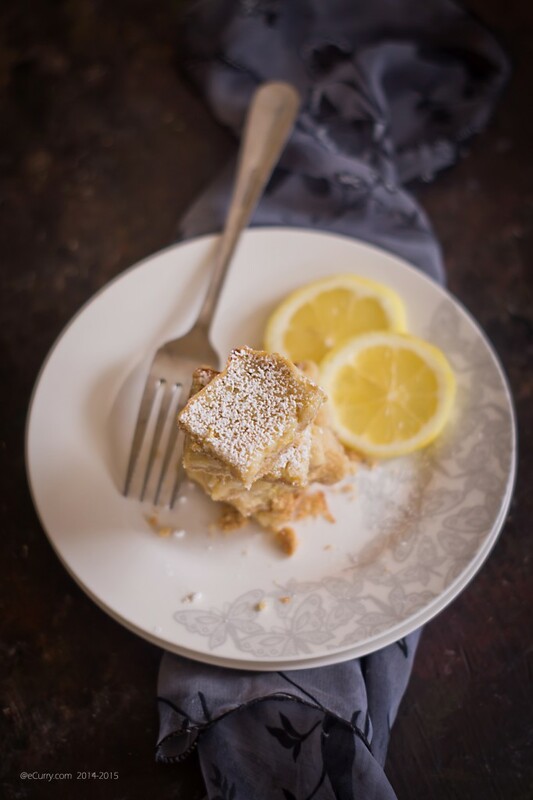 No butter or eggs in a lemon bar? I’m stunned. I’d even slide the marker to “great” based on that alone. I just wanted to take a moment and congratulate you for such great photographs. 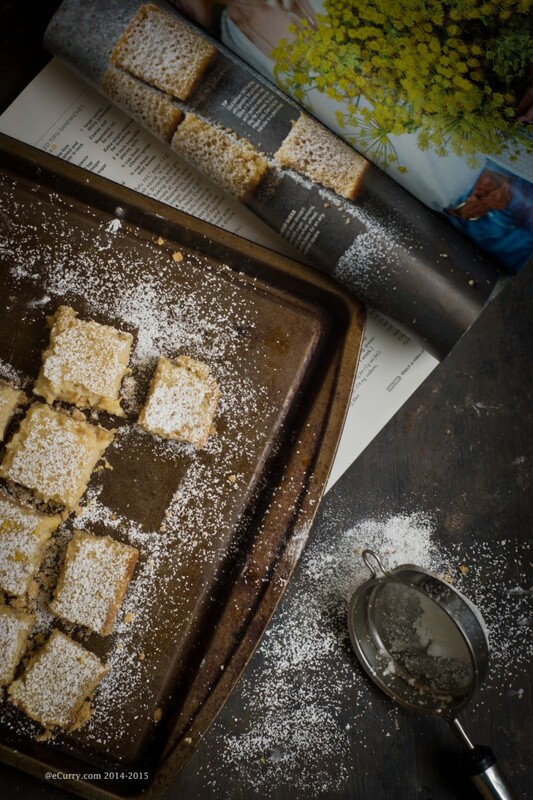 Hard to even focus on the recipe when I am simply drawn into these pictures. I really appreciate the time and care you take to create these beautiful images. Yes, there are people like me who do notice the efforts that go into creating it. Once again, Soma, Congrats!!! You outdid yourself, yet again, and I know this is not the last time I am saying this to you. BTW, did you use a 50 mm lens? OMG! Thank you so much! And allow me to say that people like you inspire me to keep going 🙂 Thank you so much. Yes. I usually use a 50mm lens for the food photography, unless it is an unplanned outdoor shoot. 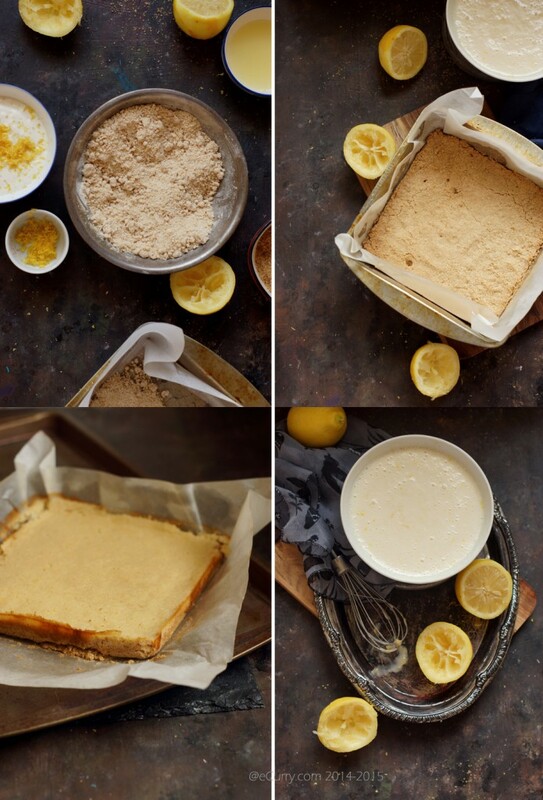 I can’t believe it – a vegan lemon square. I didn’t think it was possible but you’ve given me all the incentive I could ask for to try these. I’m hosting my sister-in-law’s upcoming baby shower and have been struggling to find a variety of dairy-free desserts to make. I’m going to test this out. Sound Good!!! Seems so delicious. I will prepare this for me and hope it will be so testy. Bytheway what is turbinado sugar? Can you please tell me in details? Turbinado Sugar is raw and unprocessed sugar. It can be substituted with regular sugar. 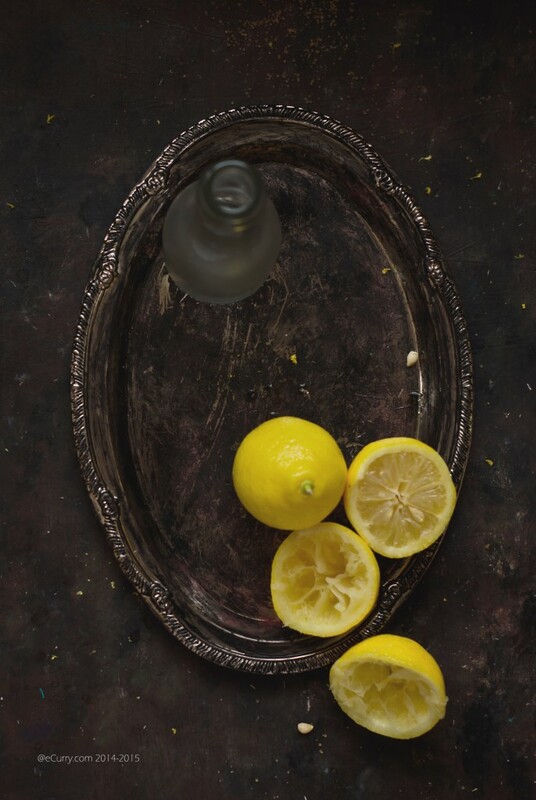 These look so pretty and delicious.. awesome photography!! I really like to write and I’m pretty good at this. But whenever I try to write a story or something I begin good but always end up throwing it away–I cannot seem to finish it… Sometimes I have a great idea that I really like but it can just hard for me to compose a story approximately and keep going. I like creative writing, but now I’ve nearly given up mainly because I won’t be able to even write a short story. HELP!!! What should I perform?. Any good creative writing websites to help me get started? Books?. I’m DESPERATE! !.